I waited almost four months for my turn with Rosemary Hill's God's Architect: Pugin and the Building of Romantic Britain from York City library, which is a heartening testament to the popularity of large, historical tomes throughout the lending network. I've noted it several times before - when I request fiction, it usually comes in within a matter of weeks; when I request non-fiction it can take months and then I only get the minimum 21 days to read it. * Not that I'm surprised by this particular book's popularity. Hill has benefited from a lot of buzz, earning starred reviews in the broadsheets and then being shortlisted for the Guardian's First Book Award. Having strolled my way through its 498 pages I consider that both the praise, and the shortlisting, is well deserved. The subject matter is definitely attractive. The mid-nineteeth century and Gothic architecture will always be crowd pleasers, and Augustus Welby Northmore Pugin is one of those extravagently romantic figures who proves impossible to resist. Bearing a name like that how could it be otherwise? 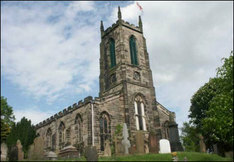 With a prodigious talent for synthesising historical motifs and modern innovations, he designed and built some of the most beautiful of early Victorian churches (right: St. Giles, Cheadle), and helped to inspire a Gothic crafts movement that would literally change the face of England. At the same time he stood at the centre of the great nineteenth century debate about religion in Britain; a convert to Romantic Catholicism, but with High Anglican sympathies, he traded blows in the pamplet wars that galvinsed spiritual movements in the 1840s and 50s. His story, and the story of his age, is labyrinthine to say the least. Yet Hill's accessible style and easy manner make God's Architect eminently approachable and serves to domesticate its daunting intellectualism. I haven't enjoyed a life as much since I read Claire Tomalin's tour-de-force Samuel Pepys: The Unequalled Self last January. Pugin was born in London on the 1st March 1812, the only child of aging parents. His father, Auguste Charles (left), a French emigre and illustrator, was forty-five; his mother, Catherine Welby, was forty-four. They had been married without issue for almost twelve years. Both had genealogical pretensions to nobility. 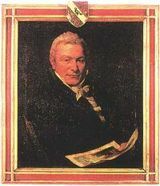 Auguste Charles claimed to be the son of an aristocrat who had escaped the French Revolution by a hair's breadth and had subsequently fallen on hard times in exile in London. (At times he even styled himself 'le Comte de Pugin'.) Of course, he was nothing of the sort and mostly everyone knew it - his father, Joseph Nabor, had been, first, a soldier and then, later, a footman; his grandfather, Jean-Claude, died an agricultural labourer. By 1812 Auguste was an architectural and decorative illustrator of the middling sort, conceptualising schemes from architects' designs, and running a drawing school for live-in pupils in the attic of his rather cramped house. His wife had somewhat more right to her pride. It was true that Catherine was descended from old gentry - the Welbys of Lincolnshire, a family resident in the county since before the Conquest. But her father was one of many sons and belonged to a junior branch of the line. He owned land but it was not profitable enough to live on, and so he had become an attorney, practising in King's Bench and living in Islington. Catherine was his third daughter and in 1800, unmarried at the age of thirty-three, had seemed destined for a long spinsterhood until Auguste had come along and charmed her with his romantic pretensions and broken English. Theirs was a mature union, apparently of diametric opposites - by all accounts Catherine was serious, ambitious and determined, while Auguste was whimsical and fretful - but they seem to have been happy together. Their son was 'the pride of papa's and the anxious joy of mama's heart' (or so wrote his aunt Selina), and the sole focus of their benign interest. Rosemary Hill is eager to demonstrate that he was a precocious infant and who, having absorbed the full extent of her research, could disagree? At the age of 1 year and 9 months Pugin was learning to read and write (a skill which, ironically, he seems never to have properly mastered in adulthood). He drew his first drawing for a gothic church in 1821, aged 9; and in 1827, at the age of fifteen, he was designing and building 'mediaeval' furniture for George IV's renovations at Windsor Castle. Much of his childhood was spent in his father's studio, where he served his apprenticeship copying mouldings and motifs for publication in architect's sample books. Auguste Charles used his pupils, and thus his son, as draughtsman on many of these projects (Architectural Antiquities of Britain (1821-23), Architectural Antiquities of Normandy (1827) and Examples of Gothic Architecture (1831) are just three examples) and they travelled around the churches and ancient cities of England studying architecture, scuplture and framework with him, in pursuit of the perfect examples of buttresses and cornices. It was an immersion in the medieval and early modern architecture of England, with all its French and German influences, that would serve Pugin well in the future. To manage it the designers had begun to use techniques borrowed from Picturesque landscape painting, the wings and flats arranged with irregular masses in receding fields... A three-arched structure divided the stage halfway down to define an interior playing area. It might represent doors or windows; in one case at least, it was actually a Gothic rood screen. The space within a space, the Picturesque idea of revelation by partial concealment, became one of Pugin's favourite architectural devices. Photographs of the interior of St. Giles, Cheadle (below) give some idea of what she means. It is one of the most interesting and moving aspects of Pugin's career that he approached every project wholeheartedly, designing everything from the building downwards to its furnishings and decor. After the dizzying achievements of his adolescence (and the deaths of his parents while he was in his early twenties) Pugin was catapulted onto the national stage when he met and befriended John Talbot, the 16th Earl of Shrewsbury in the autumn of 1836. He had just decided to set himself up as a designer of buildings and Hill paints a portrait of him as charismatic, enthusiastic, somewhat ill-kempt (if not a little dirty) and impossible to dismiss. The modest, unselfish and pious Earl seems a direct contrast but, as with so many things in Pugin's life, it was contrast that made the match, and Shrewsbury became Pugin's greatest patron. His great house Alton Towers (now part of the theme park of the same name) was enormously altered by the young architect. Throughout the 1830s and 1840s Pugin designed and built churches across England and Ireland for patrons, most of them Catholic converts like himself. He often had half a dozen projects in the making at once, as well as work for other architects, most famously the interior of the Houses of Parliament for Sir Charles Barry. His popularity was the result of a confluence of both personal qualities and cultural trends. He was tireless, motivated and endlessly inventive, and his penchant for the Gothic, which he had first learnt in his father's studio, was timely. The 1830s saw the beginning of a fashion for all things 'medieval', an inkling of a sensibility that would later inspire the Pre-Raphaelite Brotherhood and the Arts and Crafts movement. Pugin appeared with his rood screens, soaring arches, meticulous stained glass and densely decorated interiors at just the right moment. Not that Gothic revivalism was anything new in the 1830s - Horace Walpole had built his faux-Gothic house at Strawberry Hill in the mid-eighteenth century - but it was suddenly influential. In his first book Contrasts, published in 1841, Pugin captured one of the main reasons for this enthusiasm: the clean order of the past contrasted positively with the fearful machinery of the present. 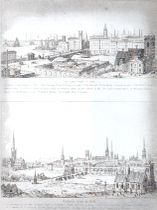 In a series of images, shown side by side, Pugin set up a dichotomy between the medieval and the Victorian that emphasised the superiority of the former: the workhouse compared with the monastic hospital, the walled town with the sprawling city, the Gothic cathedral with the plain box chapel. At the same time he made a spiritual and moral correlation. The medieval was Catholic, with a moral system that engendered a sense of community, encouraged support for the poor and set a clear social order. In comparison the modern was ugly, grasping and Low Church. He figured the Reformation as the horrific break with this pre-lapsarian England, and abhorred the cold frigidity of eighteenth century Classicism. Like Thomas Carlyle in Past and Present, he evoked the 12th and 13th centuries as nostalgic utopias to which Victorians could only return via a revival in Gothic aesthetics and Catholic spirituality. None of this was very well thought through, and although he wrote with a good deal of passion and verve, Pugin was forever stumbling over his own ignorance. Critics were quick to throw the Renaissance in his face. But he had a feel for things, rather than a knowledge of them, and merrily bumbled from one ideology to another. He was easily inspired by others, and then just as easily persuaded against them; later in his life he toured Italy and finally discovering the architecture of the Renaissance, poo-poohed it as rubbish. He would be best described, I suppose, as a Romantic sensationalist. Still, it is impossible to dislike him. His letters reveal a man as naive and thoughtless as he was clever and witty. It is clear that Rosemary Hill likes him a great deal and has considerable sympathy and affection for him. Her writing is filled with warmth and it is to her great credit that she has turned the surviving documentation of his life - the one line per day work diaries, the endless plains and drawings and the plentiful but mundane correspondence with his contractors and clients - into a fascinating psychological narrative. She has written a doorstopper of a book, but with the research and the clear thinking to justify it. Kudos also to her tireless footnoting, and her thorough appendices. If you have any interest whatsoever in the nineteenth century, in its trends, or fiction, or art, then I urge you to get yourself in the library queue and read God's Architect. * I wonder if this has anything to do with the popularity of non-fiction versus fiction amongst male readers? Or just with the way people read non-fiction altogether, i.e. with a determined plan. Perhaps library readers are less likely to request fiction because, by and large, they're browsers who are happy to take what they find on the shelf, whereas non-fiction readers have specific interest and pursue individual titles?